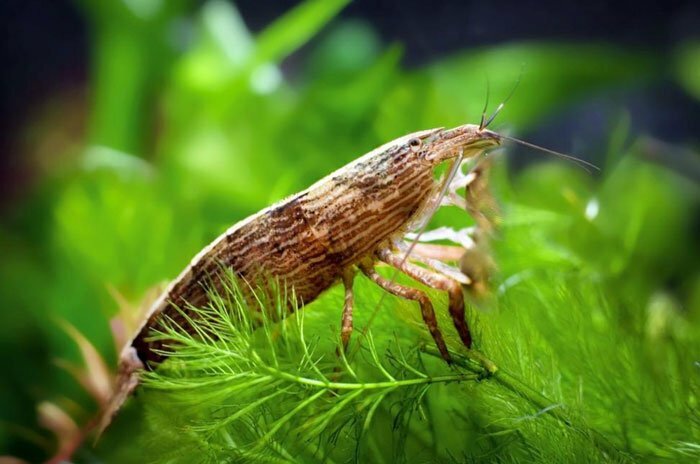 Bamboo shrimp (Atyopsis moluccensis), also known as Wood shrimp, Singapore flower shrimp, Asian filter shrimp and Asian feeder shrimp, are favorite among shrimp fans. Bamboo shrimp grow to about 3 inches (7.6 cm) at maturity. Female Bamboo shrimp are smaller than the males. Colors are typically tan, brown and reddish. 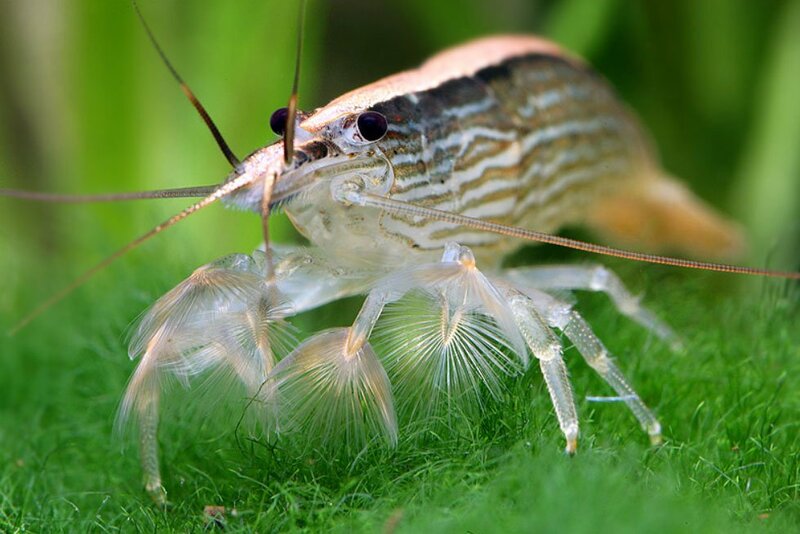 The shrimp have thin, tan stripes down their sides and a wide light-colored stripe on their back. Color variations are common and are probably due to age, diet and water conditions. Instead of pincers, Bamboo shrimp have four fan-like appendages called chelipeds. These are used for capturing detritus particles and plankton, the shrimp’s main diet. Bamboo shrimp are native to Indonesia (Bali, Kalimantan, Sulawesi, Sumatera), Philippines, Sri Lanka and Thailand. Typical habitats are fast-moving streams. The shrimp position themselves in areas of high flow, clinging to rocks and tree roots. They use their fan-like appendages to filter out tiny particles of plant and animal matter. The fans capture floating bacteria, crustaceans, algae, and plant fragments. These are brought to the shrimp’s mouth to eat. Many shrimps, including Bamboo, are best kept in a single-species aquarium. A 20-gallon or larger tank is recommended for keeping a group of 6 to 8 Bamboo shrimp. Atyopsis moluccensis are peaceful shrimp and like living in “herds.” The shrimp will gather on a piece of driftwood, waving their fans in the water flow. It’s possible to keep one or two Bamboo shrimp in a community aquarium if the fish are “shrimp friendly.” Cichlids and aggressive tropicals like barbs may peck at the shrimp’s delicate fans. Be sure to provide a cave for the shrimp to hide in. You may not see the shrimp for weeks at a time if it chooses to stay in its cave. The benefit of a shrimp tank is the shrimp are always visible since there are no predators to hide from. Live plants are welcome but not necessary for Bamboo shrimp. Bamboo shrimp don’t need special water chemistry requirements. But there are several conditions that must be met to keep the shrimp healthy. Bamboo shrimp can be kept in a wide pH range of 6.5 to 7.5. Water hardness and alkalinity (carbonate hardness) are not critical. A range of 3 to 10 degrees is recommended. If the aquarium water is naturally low in carbonates, the pH can drop over time. Biological filtration produces acids that neutralize alkalinity and lower pH. Maintain at least 3 degrees of KH to prevent the pH from dropping below pH 6.5. Ammonia or nitrite must be kept at zero levels. These pollutants weaken the shrimp’s immune system, making it susceptible to disease problems. Partial water changes, made every three to four weeks, will replenish alkalinity, stabilize the pH and dilute nitrate and dissolved organics. All shrimp are sensitive to metals. Many tap water sources contain copper that dissolves from copper pipes. If you’re using tap water in your aquarium, let the faucet run for one minute before using the water. This flushes away much of the residual copper that leaches into the standing water. Chlorine disinfectants, added to municipal and some well water sources, are toxic to Bamboo shrimp. Use a water conditioner that detoxifies heavy metals and neutralizes chlorine and chloramine. While Bamboo shrimp can tolerate water temperatures up to 82°F. Shrimp experts recommend keeping the water on the cooler side to prolong the shrimp’s relatively short 2-year lifespan. 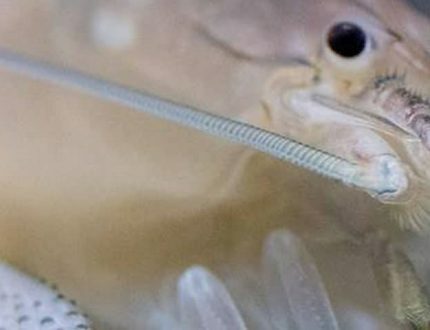 Cooler water slows the shrimp’s metabolism down, allowing it to live a longer life. Use an aquarium heater to prevent the aquarium water from getting too cool. Atyopsis moluccensis are naturally attracted to stronger currents. They’re filter-feeders and use the current to bring them food. For tanks up to 20 gallons, a hang-on-back (HOB) filter is all you need. A HOB power filter will clean the water and provide enough water flow to satisfy the shrimp. You can place a piece of driftwood in a high flow area for the shrimp to climb on. Use filter cartridges that have activated carbon to adsorb dissolved organics. 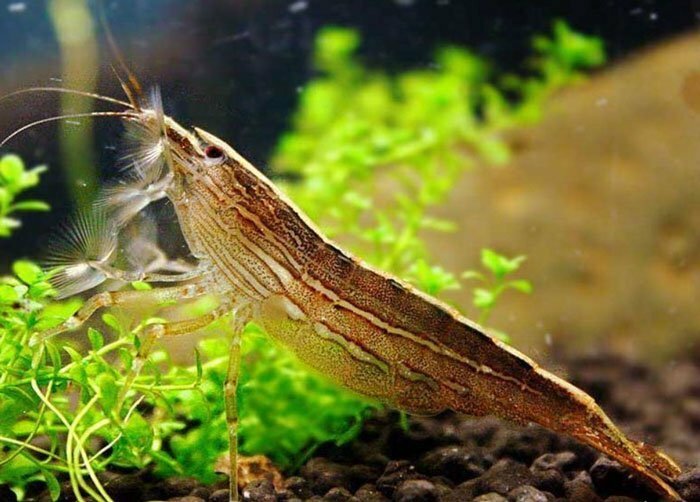 If you’re keeping Bamboo shrimp in a larger community aquarium, consider a canister filter. It’s the ideal combination of high water flow and water filtration. Canister filters are designed to hold more filter media than HOB filters. They’ll pump more water and create a good current in the tank. Some canister filters use a spray bar to create a gentle flow across the water surface. Others use a nozzle to direct the current toward a single spot. Experiment and see what type works best for your aquarium. If you can’t get enough water movement, consider adding a submersible power head. Your shrimp will find the spot they like and establish a “feeding station” where they’ll wave their fans. Be sure to service the canister filter every month. If you’re not keeping live plants, the shrimp tank can be dimly lit. Live plants will require brighter, full-spectrum lighting. LED aquarium lights are energy efficient and add very little heat to the water. You can even adjust the color and brightness with some models. Bamboo shrimp don’t like to be startled by lights suddenly turning on and off. Look for LED aquarium lights have an automatic sunrise and sunset feature! Bamboo shrimp like to explore their environment. They’ll appreciate plants, rocks, driftwood and caves in their tank. These provide cover to hide in and places to climb. Their nature is to cling to a rock while filter feeding. Consider placing a rock or piece of driftwood in the highest flow area. You may even be able to watch the shrimp feed on prepared foods when you add it to the water flow. 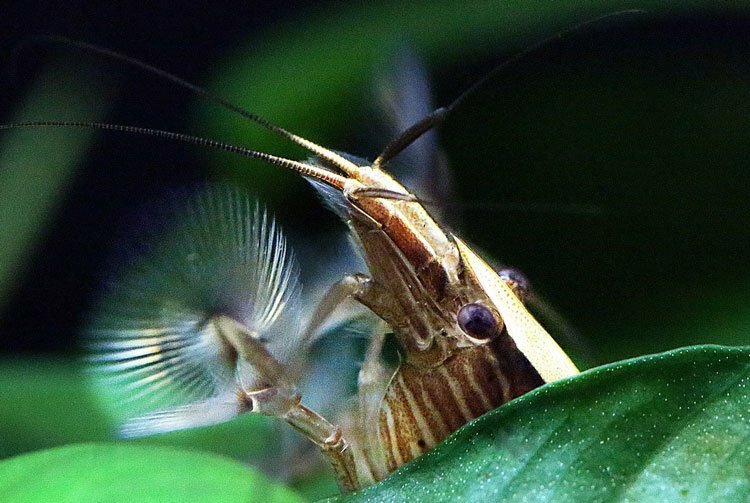 Bamboo shrimp will periodically molt. After shedding their exoskeleton, the shrimp will be soft and vulnerable to nipping by fish. A small cave is critical for the protection of the shrimp during molting periods. Coarse-sized gravel in shrimp-only tanks. Bamboo shrimp are filter-feeding detritivores. They’ll position their body directly in a water current for best exposure to floating organic particles. 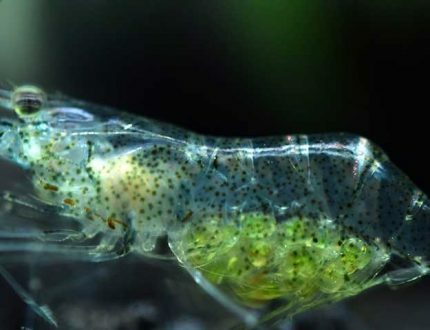 The shrimp will wave their fans, capturing tiny bits of algae, bacteria and other microscopic life as it floats by. Clumps of java moss act as a “plankton farm” providing live food for the shrimp. If the shrimp begin foraging in the gravel, it’s a sign they are not getting enough floating food. This behavior can damage their delicate fans. Feed with newly hatched brine shrimp, algae powder or powdered foods sold for coral. Experienced shrimp-keepers recommend feeding every few days. Over-feeding stimulates the shrimp to grow and shed they skeleton. This reduces their lifespan needlessly. Bamboo shrimp can be kept with certain types of tropical fish. Non-aggressive tropicals with small mouths generally ignore Bamboo shrimp. An occasional nip or curious nose-bump by a curious fish is normal and won’t hurt the shrimp. Cichlids and other large-mouthed fish will try to eat bamboo shrimp. Even if they can’t swallow the shrimp, they can be hurt by constant bullying. Most “community” tropical fish like angelfish, platys, mollies, swordtails and corydoras catfish get along with Bamboo shrimp. 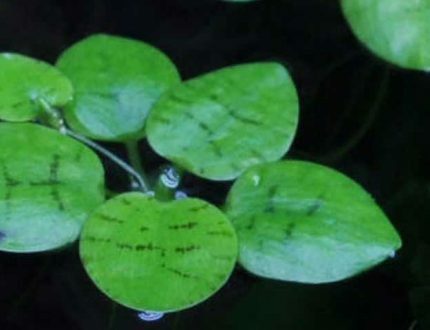 Atyopsis moluccensis requires a fresh and saltwater environment to complete its life cycle. In nature, pairs will mate in freshwater streams and marsh areas that have access to seawater. The tiny shrimp have to enter salty water to mature into adult shrimp. This is very difficult to do in the aquarium. Females release chemical attractants (pheromones) into the water to attract male shrimp. Once fertilized, eggs are released and go through the larval stages in brackish and then salt water as they drift toward the sea. The shrimp eventually return to freshwater once they reach maturity. They stay in freshwater and mate for the remainder of their lives (2-3 years). So far, there are no reports of successful captive breeding of Bamboo shrimp. All Bamboo shrimp sold in the aquarium trade are wild-caught. Bamboo shrimp may not be as brightly colored as other dwarf shrimp, but they make up for it with their interesting feeding behavior and friendly personality. They’re not hard to keep and can even be kept in a community aquarium.